A message from the desert — surf’s up! 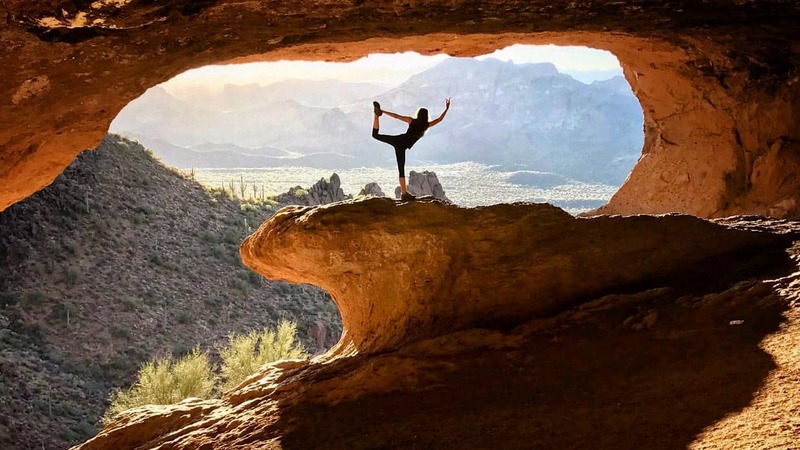 The Wave Cave Trail is short and sweet, a balance of easy and challenging, and has a glorious cave with a boulder that looks like a wave at the finish — hence the name. However, I may have chosen the absolute, most-crowded time to do it. I went on a Saturday at noon, when the sun was beaming and temps reached roughly 65 degrees. I knew I was in trouble the moment I had to wait in line for a parking spot for about 30 minutes. As someone who has been exploring the layers of the Arizona wilderness for the past three years, one might think I would know better. However, other responsibilities and obligations were quickly swallowing up my schedule, so I had no choice. Saturday afternoon it was. The first three-quarters of this trail is flat, painless and strikingly beautiful. Because of its ease, you can look all around. It’s as if you are walking directly into a landscape painting of the Superstition Mountains. 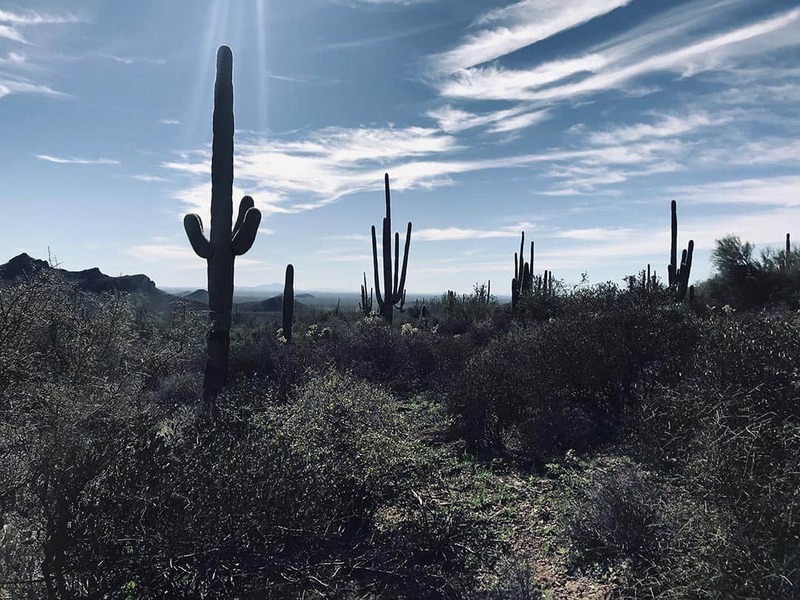 You are weaving through a valley of desert plants like saguaro, jumping cholla and prickly pear cacti, and mesquite and paloverde trees. While most of us opt for a day of hiking to escape from our typical environment — work demands, cell phones, traffic and socializing alike — this was not one of those days considering the number of people on the trail. So, I decided it was in my best interest to shift my perspective and take this as an opportunity to indulge in one of my favorite past-times — people watching. It was a pleasure to witness children enjoying the wilderness, cheer on elders as they pushed themselves to make it to the cave, feel the joy of friends reconnecting after a busy week, and greet my fellow, solo hikers. The last quarter is when you need to kick it into high gear. The vertical scramble to the top may be challenging for inexperienced hikers, or just slightly demanding for physically fit folks. Luckily, the trail is well marked. Just be sure to follow the cairns and don’t cross over any piles of rocks that are blocking off what might look like a trail. Once you’ve reached the cave, you’ll first notice the massive boulder jutting from the ground that mimics a curling wave. The cave itself is nearly the size of an apartment home and made me wonder if anyone has pitched a tent here, yet. It wouldn’t be a terrible place to sleep, either, considering the cave floor is extremely soft and sandy. When you’ve found a spot to relax, I recommend kicking off your shoes. It isn’t very often that our feet make contact with natural surfaces. They’re typically bound by the soles of our shoes. It’s no wonder people enjoy “wiggling their toes in the sand” at the beach. Fortunately, there’s an abundance of sand in this cave, so don’t be afraid to soak in that yummy Earth — I certainly did. Two hikers settled atop the boulder, a very popular spot in which hikers take photos, with their snacks and drinks. Another couple of hikers and their pups reached the cave and began taking photos with one another. But within moments, the woman approached the two sitting down and asked, “I’m going to need to ask that the two of you to move because you are in everybody’s pictures. This hike is too challenging to not be able to take photos here.” Of course, they handled the demand with grace and packed their picnic and moved aside. Shortly after the couple wrapped up their photos and began the descent, another woman approached the other two and said, “You know, I disagreed with her. I feel like this hike is too challenging to not be able to sit in that exact spot and take it all in.” Their response was, “I guess some people just have different hiking etiquette.” Ain’t that the truth. Apparently, it’s the collection of these types of photos that have been posted across various social media platforms that make this hike high in demand. I spoke with a gentleman in the parking lot who said he had been hiking around the area for the past 12 years. 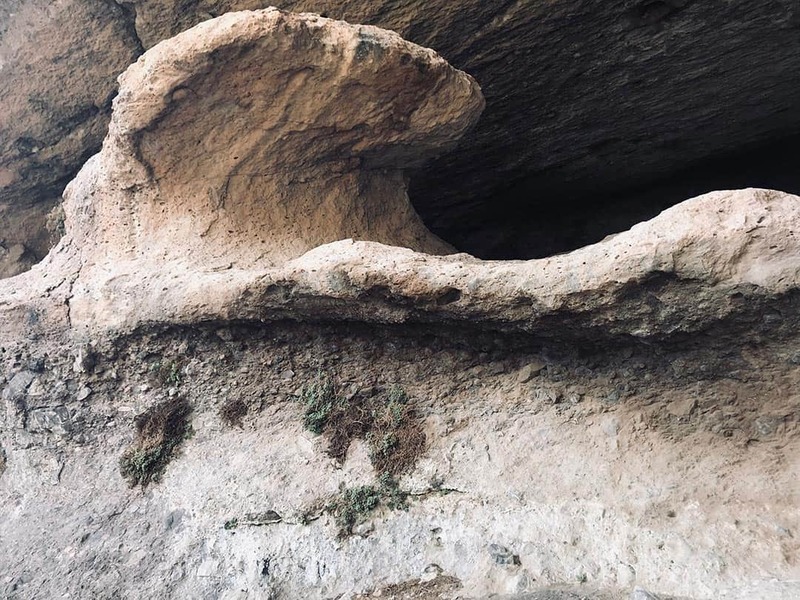 He said what is now known as the Wave Cave Trail, never used to be an official trail until about five years ago due to exposure on social media. It’s understandable, though. The photo-op is well worth it and we recommend snapping several pictures for yourself. Once you’re in the cave, if you stand directly under the curl of the boulder it looks as if you are “surfing the wave.” It’s one of the many benefits of this trek. When you’re ready to head back, watch your step on the way down. You may need to use your hands here and there. I chose to leave right when a large group of guys with a cooler full of beer arrived and when a child starting throwing a temper tantrum. Perfect timing in my opinion. If I were you, I would try to do this hike on a weekday and get out there as early as you can, or go at sunset and bring a headlamp. Not only will you avoid the crowds, but the lighting at either time of the day will be prime for your pictures. Keep in mind, though, that during the summer the temps can reach 100+. If you choose to hike during this time of the year, you must use caution and bring more water than you think you would ever need. Getting there: From Phoenix, follow US 60 East and turn left on FS77/Peralta Road. Follow Peralta Road for about 6.8 miles until you see the turn off/parking lot on your left. The trailhead is marked Carney Springs. Dogs: Yes, they’re allowed but must remain on leash. Down for some more Supes adventures? 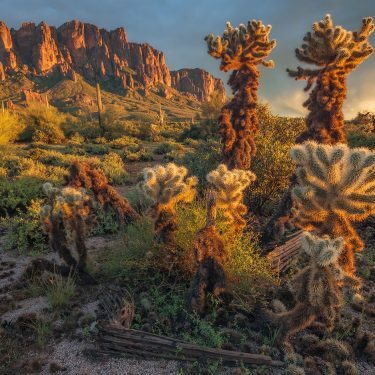 Check out our Superstition Mountains Hiking Guide. Bri Cossavella is a freelance writer for Territory Supply. She is a Phoenix-based journalist with five years of writing and editing experience. She has been published in Arizona Highways Magazine and Phoenix New Times, and has traveled overseas for her work. She enjoys all things outdoors, resistance training, authentic Indian food, and advocating for our environment and human rights. Learn more about Bri at her website or on Instagram. 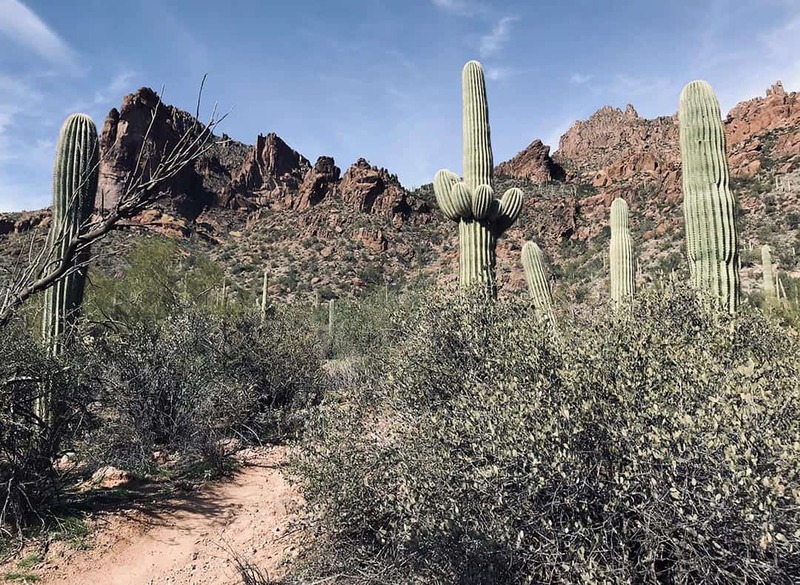 Most hikers and trail runners in the West Valley head to Glendale’s Thunderbird Conservation Park when they want to go for a hike without driving far from home. This makes Thunderbird a very busy place, yet there are many great hikes in same area that allow you to avoid the crowds of Thunderbird. 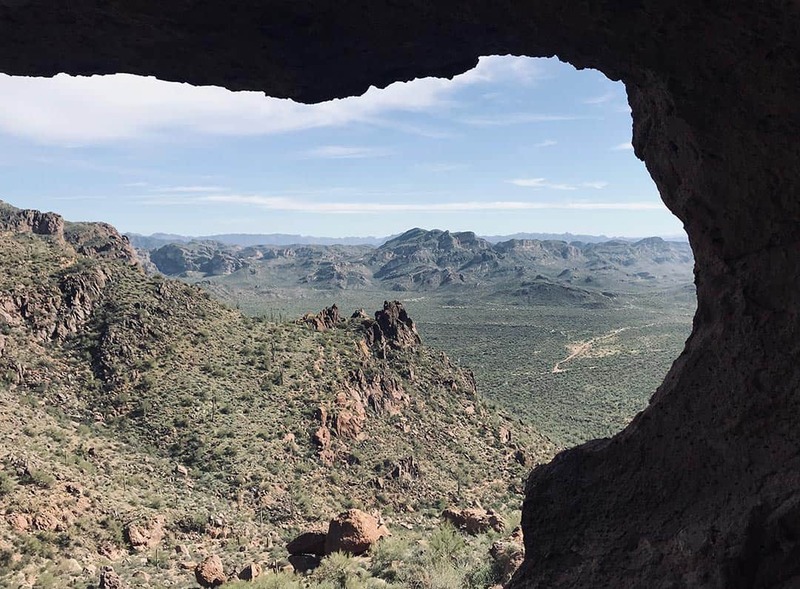 As a local resident of Peoria over the last few years, I’ve nailed down the best hikes in the neighborhood. 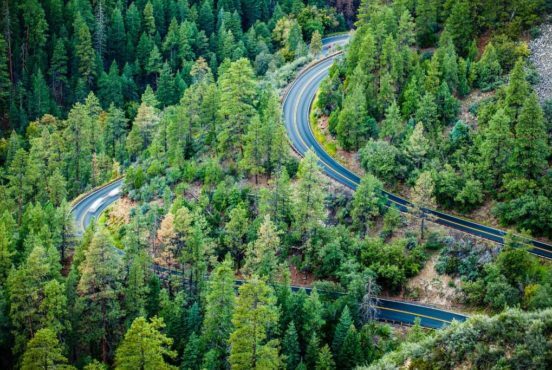 Here's the best hiking trails in the Northwest Valley! 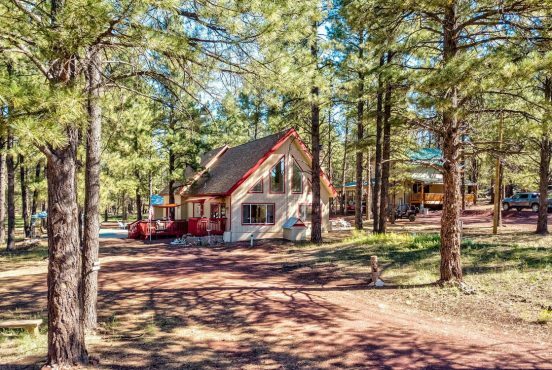 If you’re looking for an off-the-beaten path destination in the Arizona “high country,” Show Low may be just what you're looking for. 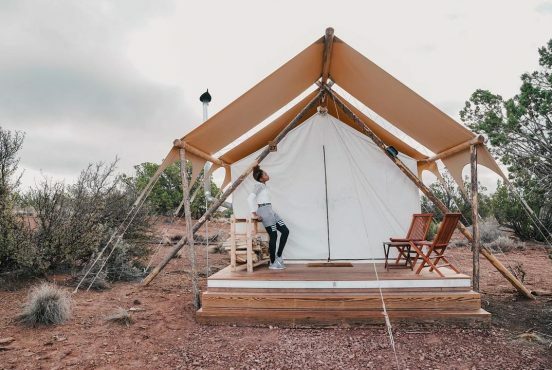 There are several ways to plan your stay at the Grand Canyon - camping or lodging in the park itself offers the most authentic, immersive experience, but staying nearby also has its perks. 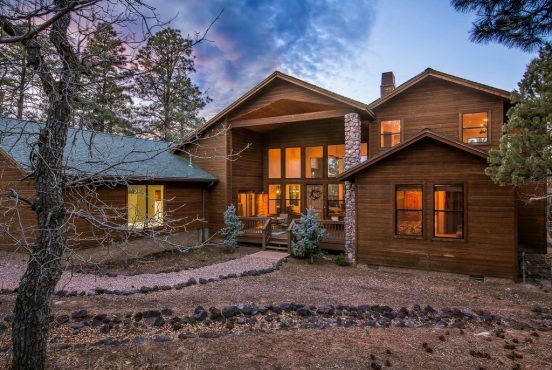 Known as a gateway to the Grand Canyon National Park, Williams is home to the Grand Canyon Railway, a stretch of historic Route 66, Bearizona Wildlife Park, and plenty of outdoor activities for visitors to enjoy. Geysers. Bison. Bears. Crowds. Traffic. These are likely the five words most commonly associated with Yellowstone National Park. The first three have quite the appeal. The following two, not so much. 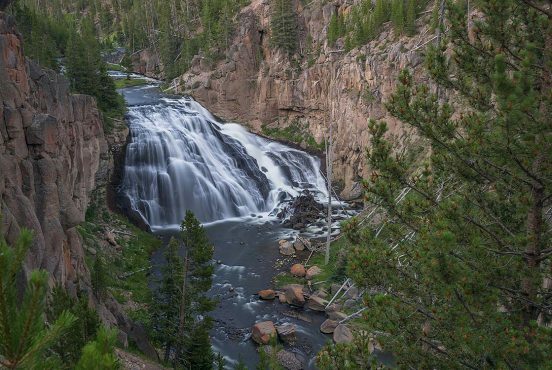 As the mecca of American National Parks, Yellowstone attracts more than just grungy outdoor junkies — it’s gotta be a bucket list item for anyone in the world that's seen photos in a picture book or on the web. 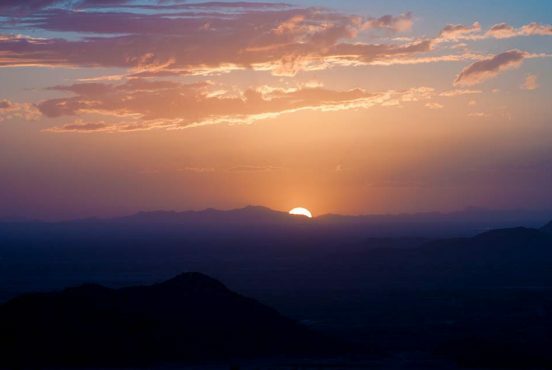 “People who live in Arizona have easy access to some of the most extraordinary landscapes on the entire planet,” says Rick Quinn, “and I’m continually amazed by how few Arizonans take advantage of more than a tiny fraction of their options.” Rick is the author of the new book Arizona and New Mexico: 25 Scenic Side Trips, a guide to road trips that start and end at Interstate highways but take travelers into the heart of what makes the Southwest so captivating. 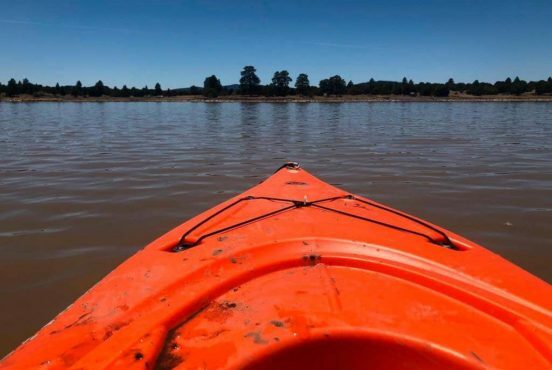 Tucked away on the Coconino National Forest near Flagstaff, Kinnikinick Lake is small enough, remote enough, to enjoy a day of nearly solitary water recreation. 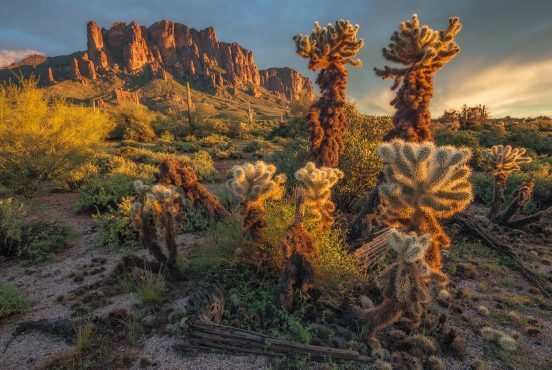 Just east of Phoenix, the rugged Superstition Mountains shoot nearly 6,000 feet into the sky. 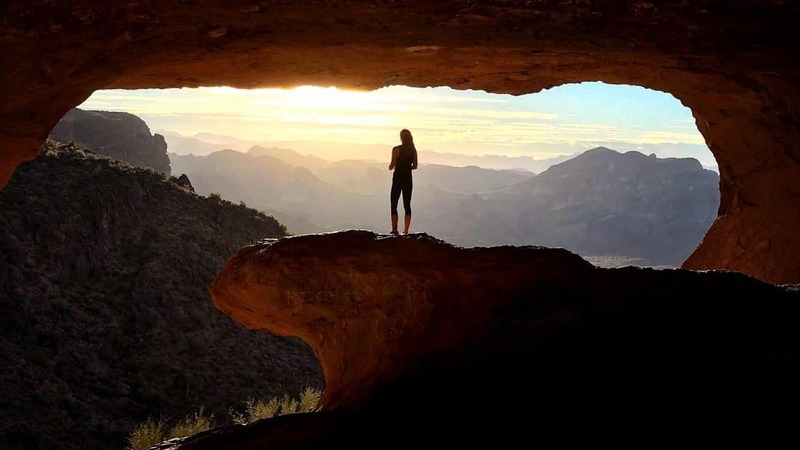 Here's a look at 20 of our favorite hikes in the famed Supes.